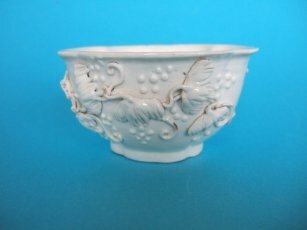 An attractive Chinese Blanc-de-chine cup. The press moulded lobed body applied with leaves, tendrils and berries (grapes?). Unusually the cup is made in what appears to be a type of soft paste porcelain that is not translucent. Then applied with a thick creamy glaze. It almost seems like tin glazed earthenware. Measures 8cm. x 6.8cm. at the rim and 4.2cm. high. There are no marks. There is a small chip to the edge of the rim. a few small losses to the applied leaves and tendrils and some firing cracks. 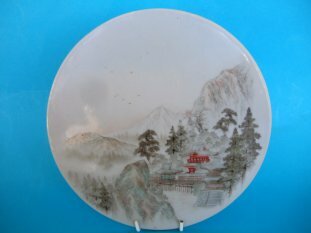 An attractive Chinese circular plaque probably of 20th.Century manufacture. Finely painted with a retreat in a mountainous landscape. Measures 22.8cm. (9 inches) diameter. It has an impressed mark. Good, no damage. Some slight wear to the enamels. 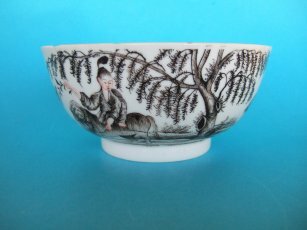 A Chinese export porcelain bowl. Decorated en grisaille with a scene of a lady on an oxen beneath a large tree. The lady is holding a branch in her right hand, a small bird clings to the branch, its wings outstretched. A man followers the oxen holding a long rope attached to a ring in the animals nose . The bowl measures 14.7cm. diameter and 6.5cm. high. Dates from c.1760. There are no marks. Unfortunately a little battered. There are several small chips, one filled, and a couple of cracks. An interesting and attractive bowl nonetheless. A Rare Chinese Armorial Plate. 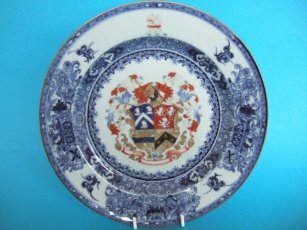 A rare Chinese Armorial plate. Superbly decorated in underglaze blue to the rim and cavetto. The centre decorated with a large and impressive coat of arms. I believe the arms are those of Alexander quartering Bennet. The upper rim has a family crest. Very badly damage and with old stapled repairs. Some inevitable wear to the enamels and gilding. Nonetheless an impressive armorial plate that still displays quite well.